The EU's legitimacy in the wake of the financial crisis was discussed by an international group of researchers in Oslo last month. PLATO has relevance written all over it, Vice-Rector Åse Gornitzka said at the project's kick-off Conference. European integration was long seen as unproblematic. Then Brexit came as a shock. ‘The world is changing, and it's both exciting and frightening,’ Professor Johan P. Olsen says. The 22 July Commission in Norway was closed and dominated by directors and experts. The Commission for Nuclear Waste Storage in Germany was open and dominated by expert groups and politicians. Which was better? 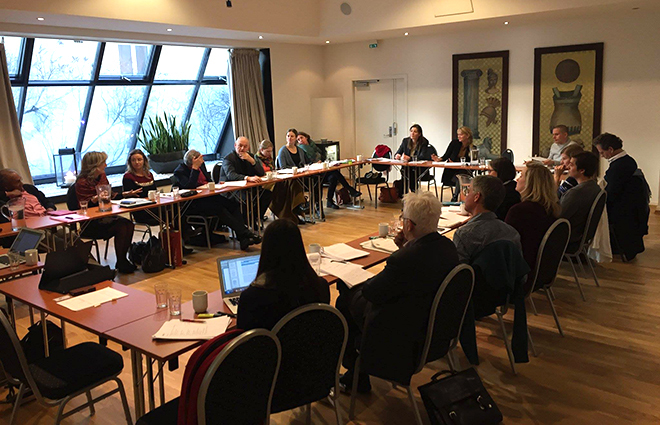 GLOBUS researchers gathered in Oslo on 19 and 20 January 2017 to discuss how to make sense of the EU’s contribution – if any – to a rightful world order. On the International Women's Day, Cathrine Holst warns that the global state of gender equality is under threat. Who is the European citizen? Who is the refugee? Things were simpler before. All refugees were political dissidents, and all Europeans were European citizens. Not anymore. The refugee crisis has affected the way we view not only refugees but also European citizens. Half of all Norwegian jobs will require a masters degree in the next ten years. It will therefore be increasingly important to ensure universities' success, says FLAGSHIP researchers to University World News. Jarle Trondal and Christopher Ansell have written a column for Statecrafting.net, building on their newly published book Governance in Turbulent Times.